Horrible Histories Will Return to the West End's Apollo Theatre with Barmy Britain—Part Four! A scene from "Horrible Histories: Barmy Britain—Part Four!" Birmingham Stage Company has announced a summer 2019 production of Horrible Histories: Barmy Britain—Part Four! at the Apollo Theatre, marking the hit comedy's eighth year in the West End. The latest run will begin previews on August 1 and open on August 6. 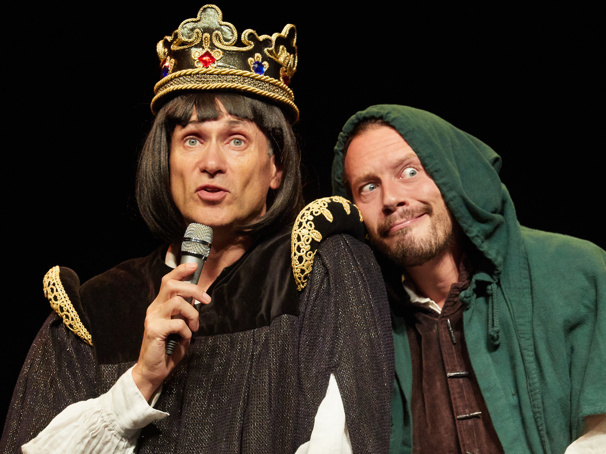 Created by Teary Deary and featuring Neal Foster, the Horrible Histories series takes audiences on a fun, lively and unusual journey through history. The production is directed by Neal Foster and designed by Jackie Trousdale, with lighting by Jason Taylor, sound by Nick Sagar and music by Matthew Scott. Horrible Histories: Barmy Britain—Part Four! will play a limited engagement through August 31.